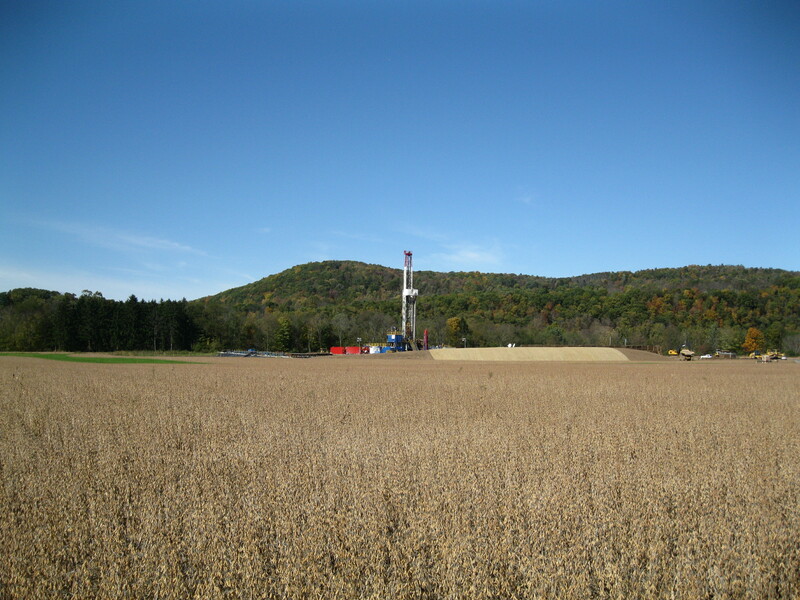 Tower for drilling horizontally into the Marcellus Shale Formation for natural gas, from Pennsylvania Route 87 in southern Upper Fairfield Township, Lycoming County, Pennsylvania, USA. Photo: Wikimedia Commons. One of the big questions that communities and rural land owners face these days is whether the benefits that come from oil and gas drilling outweigh any risk of pollution. Many flat-out say ‘no.’ Others say there are very few real problems and that a lot of fear mongering takes place among those who oppose fracking. This excellent report from Associated Press provides some perspective on how frequently problems occur. It’s not a comprehensive review of drilling across the nation, but it is an eye-opening account of just how frequently water pollution does occur in four states where the question was explored. Read more: Some states confirm water pollution from drilling. This entry was posted in Uncategorized and tagged Drilling, Environment, Fracking, Nature, Oil and Gas, Water, Water pollution. Bookmark the permalink. I’ve been intrigued by the huge controversy over fracking, especially since at least some of the problems that stem from it are also problems that are associated with conventional oil and gas drilling. One of the things I’ve been disappointed about for years now is the distinct lack of research into Michigan’s oil and gas program and contamination from conventional drilling. I became aware of this while researching the issue of directional drilling under Lake Michigan. The oil and gas industry in Michigan made a huge big deal about the lack of contamination from the 13 such wells that had been drilled. I may have convinced one or two reporters to learn about and acknowledge that it made sense to look at contamination problems associated with conventional drilling, since with directional drilling the problems would be at the wellhead. But still the media attention was narrow and often uninformed. Following that, I did some additional research and found huge contamination issues (my focus was mainly on the West MI shoreline) and program flaws – for example, loopholes on reporting by the industry. One of the biggest problems I found was that contamination issues were overseen by the Office of Geological Survey, which has a pretty close relationship with the oil and gas industry, not by the Remediation and Redevelopment Division. Then you add to that the question as to the ability of OGS (about 60 staff total) to provide oversight on more than 18,000 active wells in the state. Granted it is a complex issue and Michigan likely does better than some southern states as far as oil and gas, but I am still disappointed in the lack of interest in knowing more about it. I worked on this issue for years and finally had to give it up. If the media does not cover it, it is not an issue, apparently. Tanya: Unfortunately it often takes hard results, documented problems, as this piece shows-to get them interested. Unless a news outlet has a dedicated investigative unit, or reporter, it seems everyone these days is spread terribly thin and running fast to get the next little new bit. Tangible problems rather than theoretical may get some to move on it. Until, that is, there is a solid history of tangible problems – then the theoretical is more than a rhetorical exercise. Of course, one would hope that common sense prevail – and that sound theory would motivate, but alas….. I suspect this piece took a substantial commitment of staff time and resources to accomplish. Thanks for commenting.